While this information can be hard to understand, experts have warned that ignoring the nutritional information on food packaging is leading to the obesity problem facing the UK. More worryingly, 4 out of 10 people who already have some form of heart disease admit to not checking food labels, while those with high cholesterol also ignore labelling. The research also found in some cases that more than 80% of people struggled to make sense of labelling and struggled to figure out whether the food was high or low in sugar or fat. Participants were asked about how often they read nutritional labels found on food packaging, and the results found that 35% of men never read the labels, compared to just 5% of women. Participants also stated that they were more able to understand the traffic light system, a colour coded nutritional guide which quickly tells consumers how much fat, sugar and calories there are in a product. 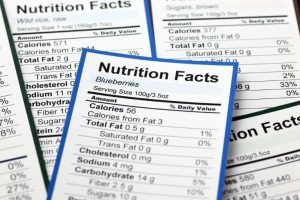 Although the traffic light system is easier for many to understand, it is not a mandatory system and manufacturers can choose to display the nutritional information however they want. There are now calls for food labels to be improved in order to increase public health and to advise consumers on the types of food they are eating. What do you think? Are you confused be food labelling? Leave your comments below.